The hotel has its own recreation equipment that accompanies the guests' stay at all times. When it comes to having fun, our Animation Department will be waiting for you with a diverse and complete schedule of recreational activities, sports, interactive games, for all tastes and all ages. The hotel offers guided tours through the Termas del Arapey area made in its "Trencito Arapey" the tourist environment of hotels, cabins, thermal pools complex, Thermal Well and the Floating Gardens of Termas del Arapey. For those who wish to live an unforgettable experience, we invite you to enjoy our horseback riding. The hotel has gentle horses, saddled, all trained for the use of our guests. In the company of a trained guide, you will live an unparalleled adventure while riding a horse through the different landscapes. 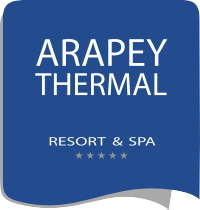 Arapey Thermal Resort & Spa has soccer and amateur volleyball courts and two tennis courts. We have a games room equipped with Ping-Pong tables, pool tables, shuffleboard and assorted board games. In the Kid's Club, the youngest will enjoy endless games since dawn. Crafts, Wii room, guided tours, are just some activities in which children can entertain healthy and healthy during the day, while the largest choose other fun options or a well-deserved rest. From very early in the morning until late at night, the recreation of the Arapey Thermal Resort & Spa, will lead you down a path of fun and fantasy that will make your vacation an unforgettable moment.